The 1st World Youth Congress, known as the Millennium Young People’s Congress, was announced at the United Nations in April 1999, and held in Honolulu from 25 to 29 October 1999. 800 delegates from 139 countries gathered following a global process to get youth around the world, in national consultations, choose their top ten priorities for the new millennium. 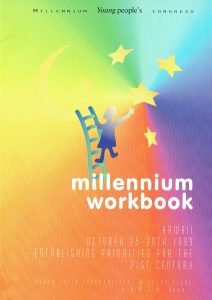 It invited youth to “Send us you priorities!” (See the ‘Millennium Workbook‘ – which, this being the days before the internet, was sent out in English French and Spanish to thousands of youth groups, and every UN Member State’s Ministry of Youth. This became a massive canvass of youth views to identify where young people, on the threshold of the new millennium, want their governments to “invest their treasure to get the best returns for the people who will inhabit our planet over the next thousand years?” We also invited them to consider the sustainability challenges – as listed in Agenda 21, and identify the steps they would take to address those challenges. We invited them to send paintings, poems, stories and photographs to show the ‘passion behind their priorities….” Many thousands did – we were overwhelmed with spectacular contributions from close to a thousand groups in over 100 countries. The Congress was a phenomenal success – due chiefly to the extraordinary appeal of Hawaii as a destination. You should know that the Peace Child team back in 1997 was offered a choice between hosting it in London at the O2 arena – or Hawaii. It took them about a second to make that choice – and it resulted in one of the most popular activities Peace Child has ever mounted. Great credit must flow to Mae Mendelson, the Hawaii organiser, who dealt with hugely irresponsible Governor of the State who cut her budget allocation in half days before the start of the Congress – when many of the young delegates were already on their way. With incredible courage and drive, she managed to fill the funding gap – and pull off a wonderful event. She was supported by a huge team of 200+ young people and a tireless Peace Child International Liaison volunteer, Alexander Woollcombe. The Peace Garden that the Congress delegates built at Diamondhead Park still exists. And the lesson of the Hawaiian Islands casts a long shadow over PCI’s commitment to sustainability. For in 1850, Hawaii was home to an independent community of about 1m people who drew all their food from the land, and the oceans surrounding them. Now – 150 years later under US rule, a community that remains at about 1m people import 84% of what they consume from the mainland. Entirely unsustainable ! And the rest of the world is trying to become more like Hawaii – rather than to become self-sufficient. One of the most interesting aspects of this Congress was the eco-village that students at the University of Hawaii built for congress delegates to live in. Totally sustainable buildings were erected in a park – and about 100 delegates lived there in a harmonious, fun community. Others stayed in homestays. And the Programme set the pattern for all future congresses – with action programmes, talent shows, fun days off, regional meetings, and serious seminars about the issues that emerged as priority concerns for the world’s youth. The International Context was interesting too: the idea for the congress came up at the 5th Anniversary Meeting of the Rio Earth Summit meeting. At that meeting, it was clear that the Rio Earth Summit process was winding down: none of the governments had come up with anything like the funds that Agenda 21 had called for – in fact, overseas development aid had fallen. So – the less developed economies felt that ‘sustainable development’ was a con trick. We asked the young people who had worked on Rescue Mission : Planet Earth, our children’s edition of Agenda 21, if they felt that sustainable development was a con – a mistake that PCI should not continue to promote: their answer was a resounding “NO!” – and so was born the idea of hosting a Young People’s Earth Summit. That idea became the Millennium Young People’s Summit – and the priorities for the New Millennium that our delegates came with were almost identical to the UN”s Millennium Development Goals. Three of the young people’s goals did not appear in the UN’s MDGs – 1) the Elimination of corruption; 2) the promotion of Human Rights for All; 3) the maintenance of Peace – and an end to violence. We believed then, and still do believe, that these goals are at least as important, if not more important, than the ‘education for all’ ‘health for all’ and other goals that governments agreed in the MDGs.